Andy Piezga Sr. of Carbondale, Pa. won last year’s Democrat Big Buck Contest with this 13-point buck he shot in Wayne County, Pa. The buck scored 79.5 in the Democrat measuring system. CALLICOON  November 19, 2010  Hundreds of hunters will be heading into the woods when the regular firearm deer hunting season begins tomorrow at sunrise in the New York State Department of Environmental Conservation’s Southern Zone, which includes Sullivan County. Tomorrow also marks the start of the Sullivan County Democrat’s 37th annual Big Buck contest. The contest is for deer taken either here in Sullivan County or in Wayne County, Pa. during the regular firearm season. Hunters who take a large buck can enter it in one or both of the two divisions in the Democrat’s Big Buck Contest. Hunters can have their buck officially measured for the Biggest Rack Division at seven locations throughout the county. Those locations are: Sullivan County Democrat in Callicoon, Rod’s Taxidermy in Callicoon, Tom’s Bait and Tackle in Narrowsburg, Neves Taxidermy in Bethel, Cannie D’s in Neversink, The Sportsmen’s Den in Callicoon and TK Taxidermy in Jeffersonville. Hunters who want to have their deer  buck or doe  entered in the Heaviest Deer Division can do so by having it officially weighed at either Neves Taxidermy in Bethel or The Sportsmen’s Den in Callicoon. The Biggest Rack Division offers a first prize of $100 and a free mounting courtesy of Rod’s Taxidermy in Callicoon. The runner-up in the division will receive $50. The Heaviest Deer Division offers three prizes: $100 for first place, $50 for runner-up and $25 for third place. Last year, Andy Piezga Sr. of Carbondale, Pa. took first place in the Biggest Rack Division. 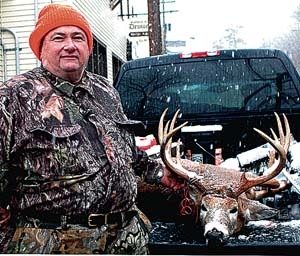 While hunting in Wayne County, Pa., he shot a 13-point buck which scored 79.5 in the Democrat measuring system.